The event is being organised by Jane Newton at the CIOB, whose contact details can also be found in the link above. The event is £5 to non-members of the CIOB and free to members and students. 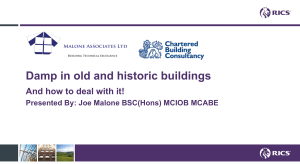 Whether you are a practising surveyor or just have an interest in old buildings then I’m sure you’ll find it fascinating. 3. Back to basics: A focus on critical technical details. 8. Condensation damp & ventilation strategy. Why chartered building professionals need their own supplementary damp training qualification and why Housing Providers should have their staff trained. We delivered another 4 hour lecture to undergraduates at Coventry University on November 23rd to supplement their academic learning with pragmatic site experience and to teach them a damp investigation process that can be used throughout their careers. Coventry University run one of the best RICS accredited building surveying degree courses in the UK and their statistics show that they are now one of the leading universities in the UK for student satisfaction. We believe passionately that future generations of chartered building professionals should not be deferring specialist damp survey work to a damp proofing industry who are significantly less qualified than they are and hopefully drive home the message by using humour to make a serious point. We offered course attendees our D.A.F.T qualification, or ‘Damp and Fungas Technician,’ because we thought that after attending a short course they deserved letters after their name to show that they were damp specialists. Unsurprisingly, there were no takers but we are hopefully influencing the next generation of chartered surveyors to not defer survey work because in fact, they themselves are the future experts in this field. 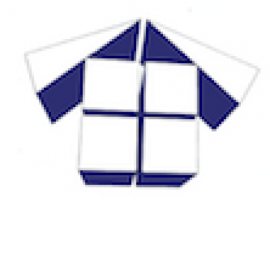 Building pathology is a core building surveying skill and you cannot practise isolated elements of pathology without first having a detailed knowledge of construction technology. Assessment of the building type is a critical part of any damp investigation and you need a construction related degree to underpin any further specialist knowledge you gain relating to damp investigation and remediation. 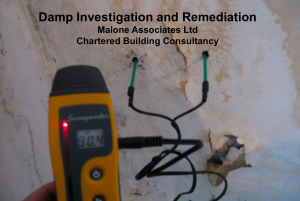 We have also believed for some time that Chartered professional bodies should be pro-active in developing a professional supplementary qualification for Chartered building professionals interested in damp investigation and remediation. Perhaps not D.A.F.T but maybe something like D.I.P or Damp Investigation Professional. You would need to be a Chartered professional to gain this qualification so as to ensure you have the pre-qualifying knowledge of buildings and building technology. In our opinion, a comprehensive course could be delivered in two days because no supplementary training in site health and safety would be needed. I would also suggest that a professional damp report is reviewed to ensure it complies with a recognised survey process and protocols before being awarded the final qualification. This will ensure that professionals have both the knowledge and the full range of diagnostic tools required to carry out a professional damp investigation. 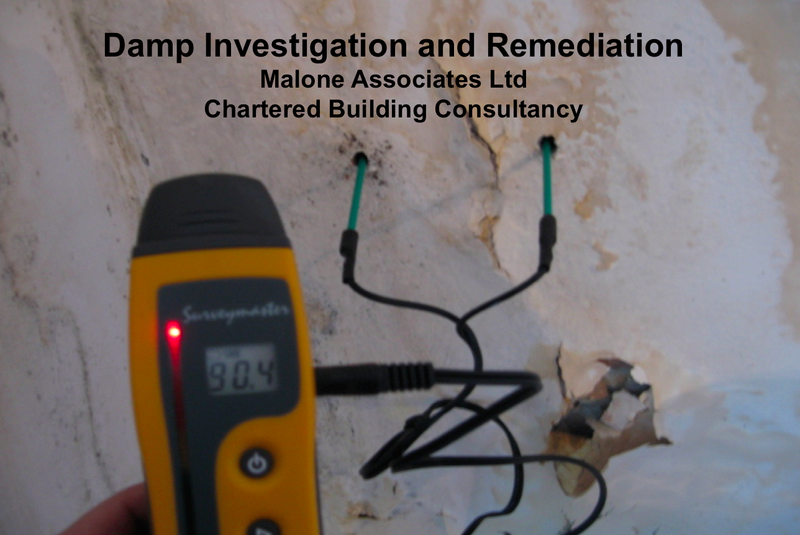 We are in discussions with Chartered bodies to deliver CPD training in damp investigation & remediation and this will possibly start in February of 2016 so please watch out for this. 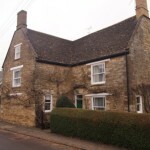 Our aim is to give Chartered professionals, or those working towards chartered status, the knowledge and confidence to stop deferring ‘specialist’ damp survey work, because in fact, it is not specialist at all, it is a fundamental part of any chartered professionals job role. We have also been training social housing technical staff in damp investigation and remediation since 2006 and I wrote our course in damp investigation and remediation because as a senior manager working within social housing I saw tens of thousands of pounds being poured down the drain every year on unnecessary damp proofing works caused by incorrect diagnosis of rising damp. Moreover, these costs were repeatable at some future point in time because damp proofing companies have no interest in curing damp, they simply want to sell systems that manage damp. It was always very difficult for me to understand why an industry so concerned with cost efficiencies did not understand that this was one of the biggest potential areas to make savings on the both planned and responsive maintenance costs. Larger social housing providers cannot employ chartered professionals every time they encounter a damp property because the budget would be blown very quickly but they should have a clear focus on curing rather than managing dampness. That being said, many providers have retained our services to deal with the more complex cases or legal disputes relating to alleged disrepair or statutory nuisance. Many housing providers carry their own technical teams, often HNC or degree qualified in a construction related discipline. We have trained hundreds of industry surveyors since 2006 and have been delighted to see these organisations completely change their approach to dealing with damp properties, they now take responsibility and have a focus on correct diagnosis to ensure they achieve a cure for the damp rather than throwing money away on unnecessary damp proofing works.